MyLoanCare Ventures Pvt Ltd. (hereinafter referred to as “MyLoanCare.in or we/ our and including www.myloancare.in and MyLoanCare mobile app”) understands the privacy and confidentiality of its customers who have shared their personal information with us. It’s our top most priority to keep the information secure and avoid misuse of customer’s personal details. By registering online at MyLoanCare or using our mobile app, you allow MyLoanCare and its business partners to get in touch with you via phone call, email or sms. The purpose of contacting you is to offer you our services for the product you have chosen, informing you about our new products, tell you about promotional offers running at MyLoanCare.in, or by its business partners and linked third parties. Under this policy, you authorize us to make contact with you for the above mentioned purposes even if your number is registered under DND/DNC/NCPR services. This authorization is valid until your account is deactivated by either you or us. 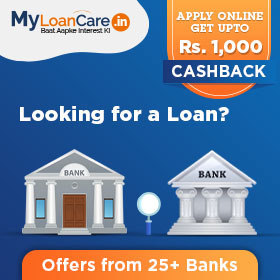 MyLoanCare.in has various types of products like loans, credit cards offered by lenders and banks. If you apply for these products or services and disclose information to these providers then the use of your information is dependent on their privacy policies for which MyLoanCare is not responsible. If you have grievance or complaint, questions, comments, concerns or feedback in relation to the processing of information or regarding this Privacy and Security Policy or any other privacy or security concern, send an e-mail to care@myloancare.in. The name and contact details of the Grievance Officer is Mr. Santosh Kumar, MyLoanCare, MyLoanCare Ventures Pvt Ltd, B-38, Sector – 32, Industrial Area, Gurgaon 122003 India.